Even and uneven cutting, crimping and bending of the component leads. Processing axial components into horizontal and vertical components on the same machine. Large assortment of crimping tools. Capabilities to process from roll or ammo pack. Automatic processing controlled by Counter. Many options and special tools available. The axis values are shown on the control panel Siemens TP177 micro. The axis values as well as the axis numbers are well shown on the display. The setup precision is 0.1 mm. The maxis values can not be stored therefore the data’s have to be stored manually to guaranty the reproduction of the geometry. All digital models of the G3 can be delivered or upgraded with the more powerful control panel SIEMENS TP 177B. · The setup values of the axis can be saved in a program. · Each database can store 200 programs. · The axis numbers on the screen correspond to the written numbers on the machine. This gives the operator a better overview. · Process reliability: The production can just be started if the positions of all axes correspond to the position of the chosen program. · Also during production the axes are permanently checked, is the position of one axe changing, the machine stops its process. · Additional data’s can be stored in the database ( Gripper size, Crimping tools, Bending tools) so all necessary information to reproduce a specific component is certain 100%. · New programs can be written very simply. There is one button needed to write all position data’s into the recent recipe. · A Barcode reader over USB can be used to call up in a simple way the program of your choice. · Error and failure messages give detailed information about what is happening in the machine and what has to be done to avoid or to solve the problem. The most powerful control unit for the G3-Cutter is the Multipanel MP277 from Siemens. Profibus-Connection between the main components, therefore better reaction time and better refreshing rates on the screen. The MP277 from Siemens is a 8” Panel with a four times higher resolution, more CPU power and more memory as compared to an TP177B. All data’s can be shown on one screen, therefore no switching back and forth to other screens. The database structure is identical to the TP177B but without storage limitations. Additional to the position of the axis, the machine speeds can be stored in the Panel as well. This makes it easier for components wher the speed is directly connected to the quality of the processing. Process reliability: Production can only be started if the position of the axis corresponds to the requested position of the chosen program, identical to the TP177B. The Axis-Setup-Assistance helps the user to setup the axis in the right order. In the G3 is a mechanic set-up is close to each other, so it does matter what axis you are setting up first, therefore making the setup-Assistance an important tool for the operator. The Maintenance-Assistance supports the operator to keep the maintenance of the machine in schedule. The maintenance is calculated by the amount of components produced. The operator receives the messages as soon as the counter over lapses. The counters can be reset and all changed to exactly fit the application. The Tool-Correction is very helpful to compensate the wear in tools with time. The operator does not have to make changes in all existing programs, there is the correction value taking care of that. This option is for a G3-D Cutter to adjust the lead length below the PCB. With this option the machine receives an additional axis, the 6th axis of the machine. This option is very helpful for production with variations in lead length after the PCB and/or different PCB thicknesses. The machine can not be upgraded by this option. An additional device for the G3-D Cutter to process loose components. The basic package of the machine includes a simple tool called LCF (Loose Component Feeding) to feed loose components. With the simple LCF tool is a production of 1000-1500 pcs per hour feasible, depending on the quality of the raw material and the size of the component. If you have to produce everyday several thousand loose components, we recommend using the CCF device. 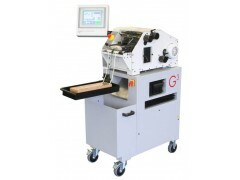 The device can be mounted within less than 5 minutes to the G3-D Cutter. The CCF device feeds the components with a toothed chain into the machine. The chain is a perfect clean and long life feeding solution. The user just has simple to place the component body between the two chains of the transport.